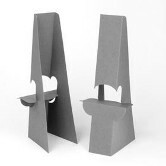 These literature holders can be used to display your take-away printed pieces on a counter, wall, display, or a sign. There are a variety of sizes and types to suit your needs. 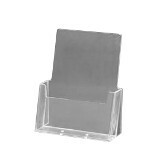 The 4" countertop literature holder is a 4-1/8” wide x 7-1/4” high free-standing literature box. It's designed to hold a stack of tri-fold brochures. 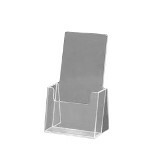 Made from extremely clear polystyrene, this literature holder is carefully finished to show off your brochures. 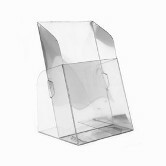 The 6" countertop literature holder is a 6-1/4” wide x 8-1/4” high free-standing literature box. 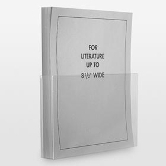 Made from extremely clear polystyrene, this literature holder is carefully finished to show off your literature. The 9" countertop literature holder is a 9” wide x 9-1/2” high free-standing literature box. Made from extremely clear polystyrene, this literature holder is carefully finished to show off your literature. 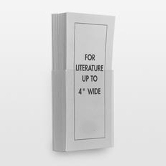 The 4" wall mount literature holder is a 4” wide x 6-1/2” high literature box designed to mount to a vertical surface. It's sized to hold a stack of tri-fold brochures or similar sized literature. Made from extremely clear polystyrene, this literature holder is carefully finished to show off your literature. 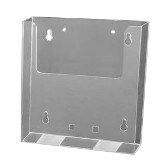 The 6" wall mount literature holder is a 6” wide x 6-1/2” high literature box designed to mount to a vertical surface. It's sized to hold a stack of bi-fold brochures or similar sized literature. 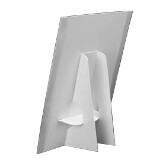 Made from extremely clear polystyrene, this literature holder is carefully finished to show off your literature. 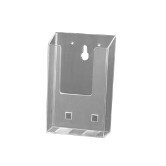 The 9" wall mount literature holder is a 9” wide x 10-1/2” high literature box designed to mount to a vertical surface. It's sized to hold a stack of letter size brochures or similar sized literature. Made from extremely clear polystyrene, this literature holder is carefully finished to show off your literature. 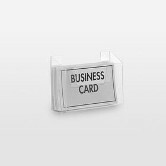 This wall mount business card holder is a lightweight, clear PVC literature box sized for business cards. The box measures 3-5/8” wide x 2” high x 1” deep and mounts to displays and printed pieces with permanent foam tape. 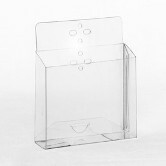 The 4" wall mount literature holder is a clear PVC literature box designed to accommodate tri-fold brochures. 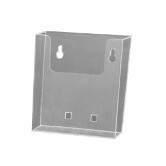 The box measures 4-1/8” wide x 5” high x 1-1/4” deep and mounts to displays and printed pieces with permanent foam tape. 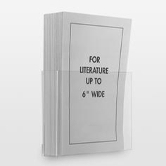 The 6" wall mount literature holder is a lightweight, clear PVC literature box designed to accommodate print pieces up to 6” wide. The box measures 6-1/8” wide x 5” high x 1-3/8” deep and mounts to displays and printed pieces with permanent foam tape. 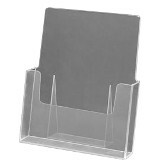 The 9" wall mount literature holder is a lightweight, clear PVC literature box designed to accommodate brochures and print pieces sized 8-1/2” wide x 11” high. The box measures 9” wide x 6” high x 1-1/4” deep and mounts to displays and printed pieces with permanent foam tape. The foldup 4" countertop literature holder is a lightweight, clear PVC literature box designed to accommodate tri-fold brochures. 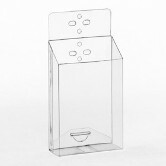 It is a free-standing, cost-effective alternative to expensive acrylic literature boxes. Shipped flat, the box assembles by locking into position with integrated tabs. The foldup 4" wall mount literature holder is a clear PVC literature box designed to accommodate tri-fold brochures. Shipped flat, the box assembles by locking into position with integrated tabs. A single piece of permanent foam tape (optional) quickly mounts the box to walls, displays, or most other vertical surfaces. The foldup 5" wall mount literature holder is a clear PVC literature box designed to accommodate brochures, samples, or other handouts. Shipped flat, the box assembles by locking into position with integrated tabs. A single piece of permanent foam tape (optional) quickly mounts the box to walls, displays, or most other vertical surfaces. The quick display easel is a white card-stock, double-wing easel with a clear plastic front piece that protects your inserts. Designed for 8-1/2” x 11” inserts, the quick-fix easel is cost-effective and reusable. It allows you to set up and replace a free-standing display quickly and easily.